Our free pick-up and delivery is another way that we separate ourselves from our competitors. Try our professional dry cleaning today and experience a fast and well-done service. “We put our customers first and deliver a quality product”. We strive for excellence in customer satisfaction while providing a wide range of services including dry cleaning, alterations, custom made shirts, tailoring, rugs, draperies, leather or suede, bedding, and wedding gown preservation. Jade Ocean Cleaners is a family-owned and family-run dry cleaning service with a commitment to quality and customer service. It began more than 20 years ago providing professional dry cleaning services to Fort Lauderdale and the surrounding areas. Jade Ocean is a pioneer in the industry, offering dry cleaning pickup and delivery service to Fort Lauderdale’s affluent society. 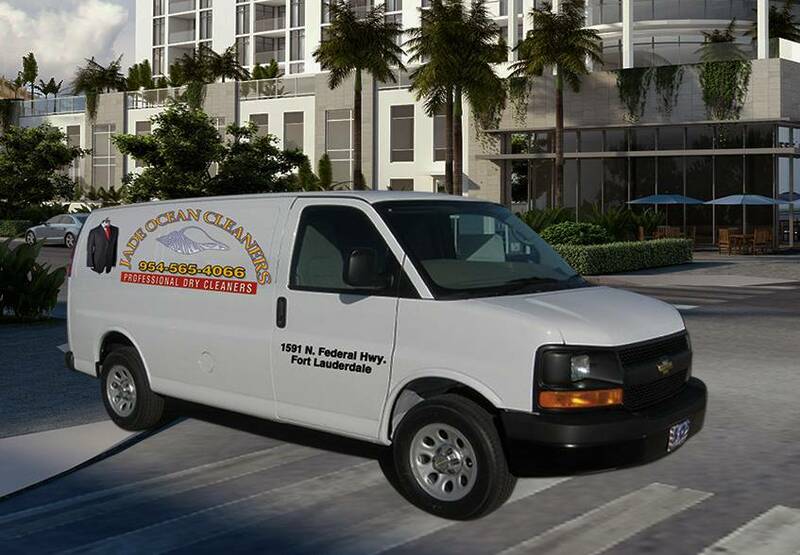 Jade Ocean Cleaners operates in Fort Lauderdale providing superior dry cleaning services and has expanded its pick-up and delivery service to anywhere in Fort Lauderdale. The company prides itself on not cutting corners and credit that philosophy with the business’s longevity. Call (954) 462-6677 today. We guarantee that you will be amazed by the results. At Jade Ocean Cleaners, we take pride in producing Fort Lauderdale’s best dress shirts. Our unique in-house shirt laundering process prolongs the life of your garments, leaves them clean and bright and doesn’t break buttons or cause rips, tears or shine. The wedding is over, your dress is a mess. You had hoped to save your beautiful gown to pass down to daughter and can’t believe how soiled and stained it is. But don’t despair, learn how Jade’s wedding dress cleaning and heirlooming service can make it like new again. Jade Ocean’s fine shirt laundry uses a unique in-house process that leaves your dress shirts looking like new. As a result, collars and cuffs come out clean and bright without fading colors or weakening fibers. Be sure to stop by to see the difference in our speed and quality. Our seamstresses and alteration specialists have over 20 years of experience working with any kind of garments. Their knowledge, attention to detail, personal care, and competitive prices will guarantee your satisfaction. We are proud to be working for the South Florida community. Our family owned dry cleaners are happy to service your dry cleaning needs in any fashion you desire. “We put our customers first and deliver a quality product”. We strive for excellence in customer satisfaction while providing a wide range of services including dry cleaning, expert alterations, cleaning custom made shirts, tailoring, rugs, draperies, leather and suede, linens, and wedding gown preservation. We take great pride in providing great service to our customers. We strive for excellence in customer satisfaction while providing a wide range of services. If your looking for top notch customer service and uncompromising attention to detail when it comes to your cleaning needs this is the place to go! They still do business here the way it should be done with honesty and integrity . My family and I will continue to use Jade Ocean for all our dry cleaning needs for years to come. Receive complimentary pickup and delivery for dry cleaning services that will fit your needs and your budget. Whether you need dry cleaning services, custom tailoring, eco-friendly wet cleaning or any other garment or fabric care, call Jade Ocean Cleaners at 954-462-6677 or schedule a dry cleaning pick-up online and start seeing, feeling and touching the difference. Be sure to stop by to see the difference in our speed and quality. Call Jade Ocean Cleaners and experience the best in customer service with our same day dry cleaning. If you are looking for professional dry cleaning, call us at (954) 462-6677.